Blyth Spartans manager Tom Wade was delighted with match-winner Robert Dale following his side’s 2-1 win against Grantham Town. But he could not help but reveal his frustration with the two penalties conceded by his side at the South Kesteven Sports Stadium. Blyth raced into a 2-0 lead midway through the second half thanks to Michael Richardson’s fantastic strike from the halfway line and an instinctive finish from Dale, but they were pegged back instantly after Dale’s goal after they allowed Danny Meadows to halve the deficit from the spot. 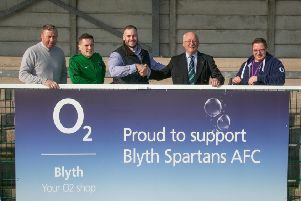 Peter Jeffries was then sent off following an altercation with a Grantham player in the box in the dying minutes, but Spartans captain Dale kept his cool to save substitute Jamie McGhee’s penalty and win the game for Blyth. And Wade was delighted with Dale’s determination to lead from the front in a poor performance from the Northumbrian club after a pre-match discussion with his skipper paid dividends during the game. Wade said: “It was one of those magical days when Robbie Dale just scores and saves a penalty. It’s what headlines are made of, isn’t it? “He’s done it before. He did it here at Grantham before, in fact. “I don’t think he had the best game in the world, but he’s getting better. “I had a chat with him before the game and I just explained how important he is in the team, but I didn’t expect him to be that important. “I think the lads are disappointed that we didn’t play as well as we can, but we have to understand that teams aren’t just going to let us play football. “They closed us down and they had three on Robbie at times, which should have allowed us to open their team up and move the ball a bit quicker. “We didn’t manage that against Grantham, unfortunately, but you don’t want to be going out all guns blazing this early in the season anyway. Despite Dale’s save, both decisions to award Grantham a spot-kick angered Wade for different reasons as he feels it just sums up the fact that his side are just gifting goals to the opposition at present. Wade said: “It was never a penalty the first one,as it was two yards outside the box, for starters. I thought it was a foul, but it was miles outside the box, so that’s disappointing. “The second one, I didn’t see it. However, when you’re away from home, you have to be squeaky clean and we’re giving teams goals. I don’t think anyone’s created a proper goal against us yet, we’ve gifted them it. Dale wasn’t the only one to receive praise from the manager as Wade insisted that he would have given his man of the match award to opening goalscorer Michael Richardson, who produced a similar finish to his audacious goal from halfway against Heaton Stannington in last season’s Senior Cup. When asked if Richardson ever just scores a tap-in, Wade replied: “Well that’s his problem, he doesn’t and he needs to. I thought he worked unbelievably hard and he was one of our better players. “He worked his socks off. We’d tried to rest him against Ashton, but he gives you everything. “We should have went a bit more defensively, but we ended up going more attacking as I kept the same team as I’d named on Tuesday but, in hindsight, I shouldn’t have. Saturday’s result wasn’t all good news for Blyth’s boss though as he bemoaned Jeffries’ “terrible” straight red card, which will result in a three-match ban for the Spartans stopper. However, that opens the door for Adam McHugh, who Wade insists can keep his place in the side if he performs during Jeffries’ suspension. Wade said: “I didn’t see it, but the lads said it was stupid and that’s it. It’s terrible. “We’ve had the fair play award for the last few years, so I’m disappointed with anything like that as we were strolling the game. We brought a couple of defensive players on to see the game out and then we shot ourselves in the foot. “I’m pretty disappointed that the game management was poor, but we’ll get there and we can’t have things like that happening at all. “I’ll have a chat with Peter on the quiet, but now he’s going to be out for three games and he’s just given his place up to Adam McHugh.